Attempts to keep global warming to 2 degrees will be wildly off course if all planned coal fire plants are built. That's the conclusion of a new analysis presented here at the UN climate conference near Paris. Researchers said construction would see emissions four times higher than the 2 degree target by 2030. They say the building plans are in conflict with the carbon cutting agendas of countries like India and China. 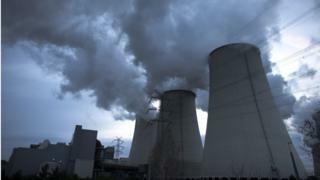 The Climate Action Tracker analysis says that 2,440 coal fired power stations are planned around the world before 2030. Emissions from the world's existing plants will be 150% higher than what is consistent with a 2 degree target, says their report. But if all those in the planning stage are actually built, the outlook would be far more pessimistic. "If all of them were to be built, they would emit 6.5 gigatonnes of carbon dioxide in 2030," said Dr Niklas Hohne, one of the research team. "If you add all of the power plants that are existing today and will still be operating in 2030, you come to 12 gigatonnes from coal fired power in 2030 and that's actually 400% higher than is necessary for 2 degrees." Scientists say the 2 degrees target is the threshold of dangerous warming. Temperatures have already gone up around one degree from pre-industrial times, according to the latest research. The coal study looks at eight countries including India, China, Indonesia and the European Union. All of them have submitted national carbon cutting plans, termed INDCs, promising to reduce or cap their emissions. But many of these countries are pushing ahead with plans for coal fired power as a way of getting as many of their people on the electricity grid as rapidly as possible. "For seven of the nine countries, the planned coal plants threaten their INDCs," said Markus Hagemann of the NewClimate Institute, who took part in the study. "This would lead to higher emissions from coal plants and it would undermine the country's efforts and it could also lead in a worst case to a displacement of renewable energy." The researchers believe that in many nations the apparent contradiction is caused by politics. Different government departments have different plans, they say, and these power battles are leading to many countries offering to cut their carbon while increasing their reliance on coal. According to some participants these contradictory signals are having a negative impact on the chances of setting a long term goal to get rid of fossil fuels. One participant said the idea of including the term in the text being negotiated here had become "toxic" at COP21. "Decarbonisation is emerging as a toxic word; many countries appear as quite opposed to decarbonisation," said Bill Hare, of Climate Analytics. "Many of those countries, though not all, whose coal plans would breach their INDCs are among those opposed to the word decarbonisation. "You can begin to draw a line between the coal stations being planned and the negotiating dynamics here of the long term goals." India and China are said to oppose the idea of including the term or the idea as the long term goal in the text. But the Indian environment minister gave a robust defence of his country's plans to continue using coal while increasing the amount of renewables. "My energy consumption is one twelfth that of US and one tenth that of Europe, so don't you think that my people also have a right to grow and use energy?," said Prakash Javadekar. "Should they remain in the dark? Is that humanity? That is why I will need power from all sources. We are increasing our renewable targets tenfold in the next 15 years but we will require coal because it is the need of the hour for my people to grow."